Leading Wholesale Supplier of finger cot, finger ext. splint, frog splint, mallet finger splint and thumb spica splint from Chandigarh. Leveraging on our latest infrastructure facilities, we are able to offer a wide gamut of Finger Cot. Our offered finger cot has strong aluminum body ensures rigid immobilization. This finger cot is examined by quality experts so as to deliver a flawless range at customer’s end. We provide this finger cot from us within a committed time frame at market price. With the aid of diligent experts, we are able to bring forth a pristine range of Finger Ext. Splint. This product is well tested on several parameters of quality for ensuring its excellence. Our product is manufactured utilizing the utmost quality material and latest technology at vendor’s hi-tech manufacturing unit. Its U design ensures full protection, easy wearing & good ventilation. Backed by the profound experience of the market, we have been able to offer Frog Splint. The available frog splints are manufactured under the direction of vendor’s professionals using supreme quality material following set standards. These frog splints provide rigid immobilization. Malleable arms can be shaped for good grip. Customers can easily avail these frog splints from us on diverse specifications. 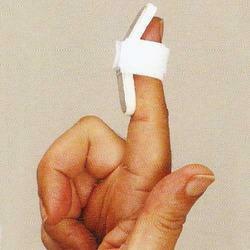 We are reckoned wholesaler and supplier of premium quality Mallet Finger Splint. 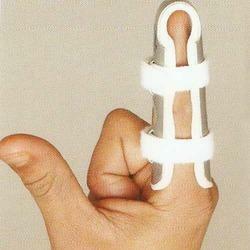 This finger splint has highly practical design to maintain DIP joint in hyper extension. Our finger splint is manufactured using high quality material and sophisticated technology in fulfillment with the set industry standards. Besides, the offered finger splint has inbuilt hook loop fasteners provides snug fitting and excellent grip. 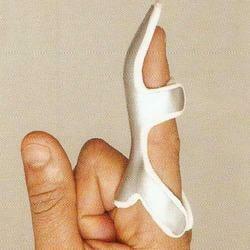 Removable malleable splint provide customized abduction of the thumb. 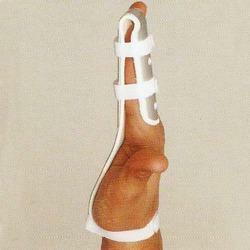 Strong splinting ensures excellent immobilization and stability to CMC &MCP joints of the thumb. Durable, PUF fused body provides excellent aesthetics and comfort. Sleek design allows full hand and finger movement. Looking for Finger Cot ?